We loved to eat ondeh ondeh when we were young for almost solely one reason, the gula melaka (palm sugar) filling which had melted and became all runny. The experience of popping one of these bite-size morsels into our mouths and gently pressing it between the tongue and the hard palate to make it burst open and release its juices encapsulated within was most memorable! It still remains very “sensational” till today, quite literally! 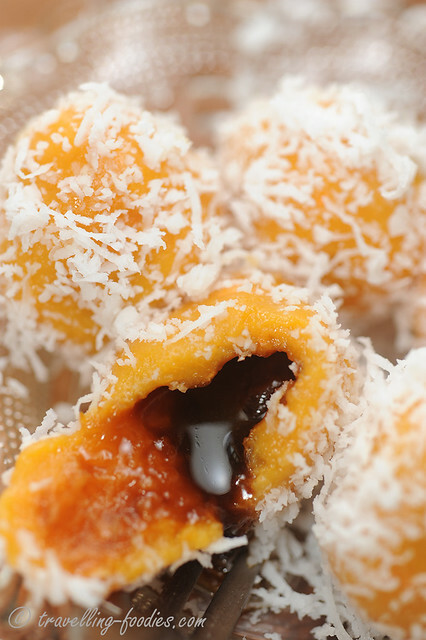 Gula melaka has a slightly subdued level of sweetness compared to regular granulated sugar. Instead, its jaggery-like flavours are much more multi-faceted, with an added dimension of darkness and depth. Extracted from nipa palm, the palate profile of gula melaka is rather unique and unmistakable. That said, buying good quality gula melaka is rather important for this dessert since it takes centrestage here. Mee rebus and ondeh ondeh share a common ingredient, sweet potato, which imparts a lovely earthy sweetness characteristic of the root vegetable to the food, not to mention the exuberant jaune orange hue. For mee rebus, it would be in the gravy and ondeh ondeh, the dough wrap. Wrapping the chopped gula meleka inti (filling) into a piece of flatten dough can be quite nerve-wrecking for first-timers. 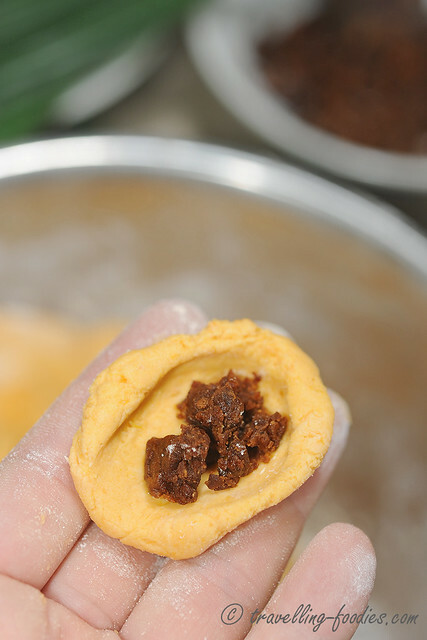 It requires a certain level of dexterity to make sure that the filling is properly encased within while making sure that the exterior of the dough remains untainted by any bits of palm sugar. More important is the ratio of dough skin to filling. Too little dough used and the liquefied filling risks breaking the barrier and leaking out. To err on the safe side and use more dough may cause one to “eat too much dough” with too little filling affecting the overall palate experience. A good ratio for me is 3 parts dough to 1 part filling. The assembled ondeh ondeh should remain bitesize, no more than 25g each to allow each of them to be popped into the mouth all at once without biting into two. I managed to keep mine within 20g each, i.e. 15g dough skin with 5g filling. I’d seen some sold commercially which are made even smaller, but I am not really in favour of that. Smaller ondeh ondeh means lesser inti and thus, watered down experience of gula melaka bursting in your mouth! Peel and slice sweet potatoes and steam for around 20-30 min or until soften. While waiting for the sweet potatoes to steam, chop gula melaka finely to an almost crumb-like texture. 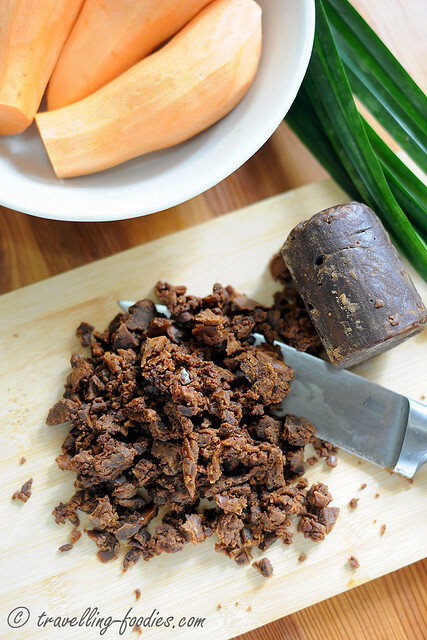 Once the sweet potato is done, place grated coconut into a dish with crushed pandan leaves, sprinkle and toss in pinch of salt and steam for around 15 min. This is to cook the coconut to prevent it from going rancid too quickly. While waiting for the coconut to steam, work on the dough first mashing the sweet potatoes in a large mixing bowl. This is done traditionally with the back of a fork but a potato ricer, masher can also be used. Process the sweet potato until no lumps are observed and develop a smooth pulp-like texture. To the sweet potato mash, add glutinous rice flour followed by tepid water. The warm water should not be added all at once but over 2-3 sucessions, rubbing and kneading in the dough, sweet potato mash and water together between each addition to form a dough. 80 ml of water only serves as a gauge as it really depends on the level of moisture the sweet potatoes have. Stop adding water when the dough becomes firm and pliable. Divide the dough equally into small pieces, each 15g. 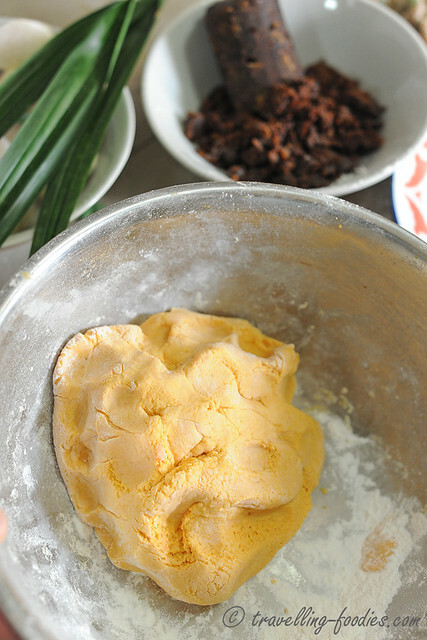 Flatten each piece of dough with your thumb and place approximately half a teaspoon (about 5 g) of gula melaka inti in the centre. Cover the filling and wrap tightly. If necessary, dust your palms and fingers with a little glutinous rice flour to prevent the dough from sticking. Bring a pot of water to a boil before lowering the flame to a very gentle simmer. Place the glutinous rice balls gently into the water, stirring gingerly to swirl the water around and prevent the dough balls from sticking to the bottom of the pot. 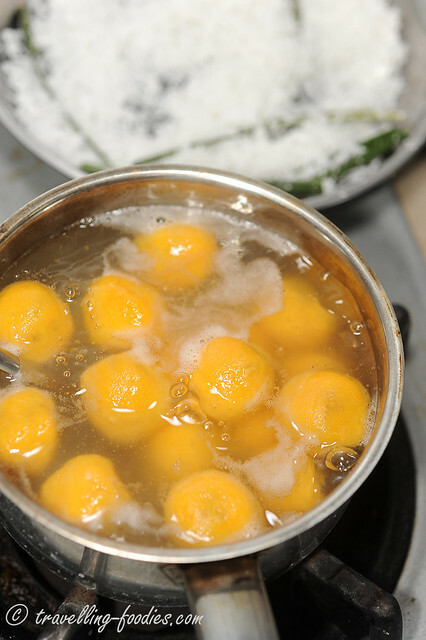 The water must be barely simmering, gently cooking of the dough balls to prevent them from bursting and at the same time, prolonging the cooking time for the gula melaka filling to melt completely. 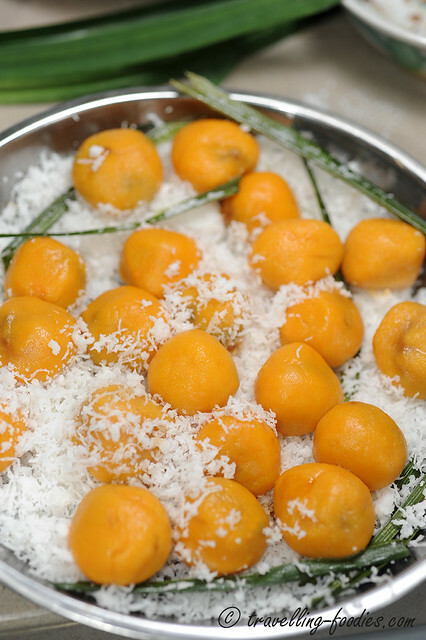 Remove the cooked balls which float up and drain slightly over a perforated spoon or a fine wired sieve before rolling them over the dish of grated coconut. A closeup of the much coveted runny gula melaka filling. A good onde onde for me is all about a good balance of dough with filling. This entry was posted on July 20, 2013 by Alan (travellingfoodies). It was filed under Food, Simple Eats and was tagged with Baba, glutinous rice, grated coconut, gula jawa, gula melaka, klepon, kue, kueh, kuih, Nonya, Nyonya, onde onde, ondeh ondeh, palm sugar, Peranakan, straits chinese, sweet potato, 土生华人. Didn’t know sweet potato was used in kuih and especially mee reebus! That’s my favourite Malay dish but its almost impossible to find an authentic one. Would you happen to know what goes into a real one? 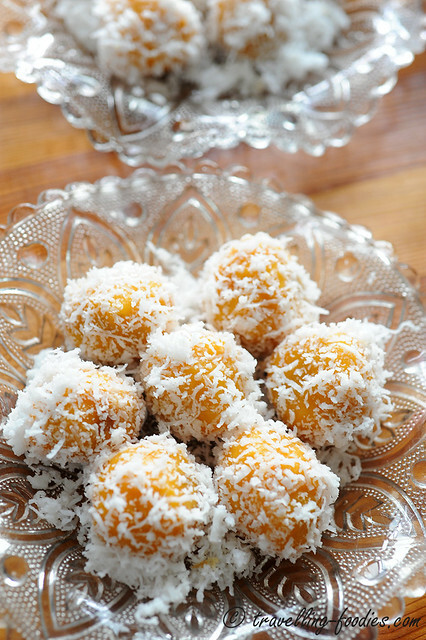 Beautiful take on this classic kuih, love it in any flavors! Looks absolutely gorgeous! Thanks for the tip on the ratio, will try it out when I make it in the future! thanks Jasline 🙂 Do let me know how your onde onde turned out! Alan, so those green de is no sweet potato? Just flour and pandan essence? depends… some would still use white sweet potato… yes, there is such a variety and add pandan juice or pandan essence. 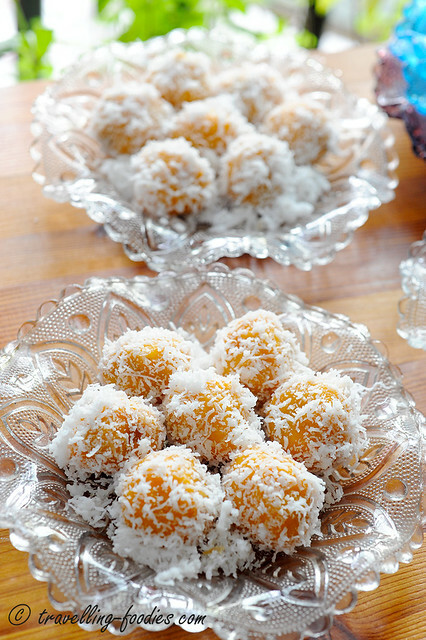 I loves onde onde that uses sweet potatoes. Absolutely yummy! Hi Alan,looks yummy ! thanks for sharing..
looks so yummy .thank you for sharing . Thanks Alan for the recipe. You are right, the Gula Melaka has to be of good grade. Must try to do it myself. Bought some recently, found myself chewing on the unmelted sugar inside, it tastes more like lump of sugar and not the runny Gula Melaka.